Learn gentle, hands-on techniques to improve your dog’s well-being and deepen your connection. Would you love to take advantage of Mary’s expertise – even if you live on the other side of the world? Thanks to the power of the internet, Mary can help you no matter where you live! If you’re an equestrian, please click here. Is your senior pet getting stiff or slow? Is your pet recovering from an injury or illness? Is your dog anxious? Do you have stiffness or aches and pains? Would you like to be more flexible, coordinated and balanced? 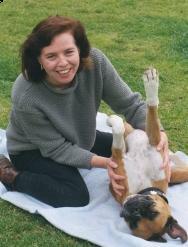 Mary can lead you through customized Feldenkrais lessons to help you regain comfort and freer movement. An online session may be the key you are looking for. And the video recording will be yours to keep! But an online session is not right for everyone. You’re willing to spend time (about 15 minutes a few times a week) facilitating a deep, healing connection with your pet. Mary can teach you how to do this. Interested? Please email Mary to learn if you’re a good fit for an online session. These sessions are conducted via Zoom. Your investment is $147 for a one-hour, recorded personal session*. Contact Mary to learn if you would be a good fit for an online session. *Recordings allow you to refer back to the information presented in the online session. You won’t have to rely on your memory! Recordings are for the client’s private use only. Click here to learn how you can help yourself and your dog with Mary’s canine video program – Age-Proofing Your Dog.